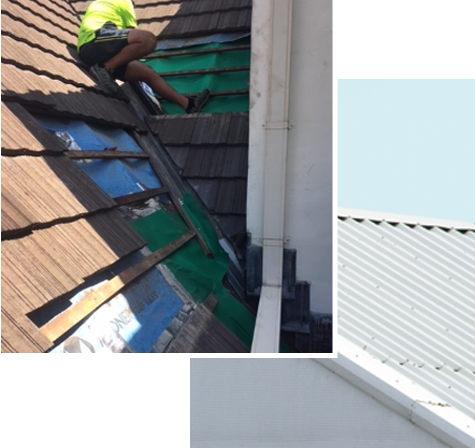 We’ve got over 25 years experience with gutter cleaning in Brisbane. Our service includes a free inspection before the initial gutter cleaning. This lets us monitor the debris buildup and give us a good idea of how often the gutters should be cleaned. If we find any damage to the roof, we’ll take some photos and send them to you as well. But most of all, we really want you to enjoy dealing with us. So we’ll arrive on time, stick to our quote & clean up after ourselves, all with a friendly smile. A regular gutter clean will prevent water ingress. All gutters need to be clean and free of leaf litter and debris to ensure that water can flow correctly to downpipes. We can complete roof and gutter repairs & install gutter guard. Don’t forget to ask about our specialised gutter cleaning system, KWR Roofing is making gutter cleaning safer! Leaves stuck in valleys and gutters create a huge risk for you and your family when bushfire season arrives. the QLD Fire Service recommends preparing as early as possible for the bushfire season. We can install high quality leaf guards, clean your roof and gutters and even trim back any overhanging branches. Overflowing gutters can be a big problem for your property. During winter we receive many emergency calls about leaks caused by blocked gutters and down pipes. It’s so important to keep your gutters clear even in the cooler months to prevent damage to your building. Heavy rain water can be managed with regular gutter cleaning. At times, it may require a replacement gutter install, but we’ve got you covered there too! We employ highly qualified roof plumbers to manage all of your roofing needs. Just give us a call and one of our team would be happy to meet and discuss your needs. We can setup a regular cleaning schedule that’s effective and affordable.